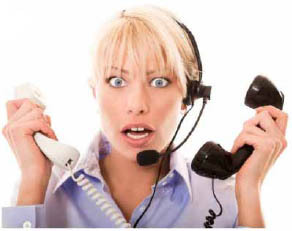 One situation many English learners find difficult is talking on the phone in English. It can be difficult to hear people properly or they might talk faster over the phone than they would in person. If the person you are talking to has an accent this can also be more difficult to understand on the phone than it would be in person. One technique that can help you is learning the kinds of phrases that are commonly used in telephone conversations. In this blog entry we will tell you some of the most common words and phrases people use when speaking on the telephone in English, what they mean and when to use them. When you answer the phone it is polite to introduce yourself by saying something like: "Hello, this is John Smith". The person you are talking to will then usually introduce him- or herself to you. If they don't, you can find out who they are by saying: "May I ask who is calling please?". When you are calling a company to speak to someone specific, or the personal telephone number of someone you have not spoken to before, a polite phrase to use is: "May I speak to Andrew Scott please?". If the person who answers the phone to you is not the person you want to speak to, they will transfer you to the person you want or give you another phone number to try. If you don't know the name of the person you are looking for, but you have an extension number for a specific department of a company, you could try saying: "Could you transfer me to extension number 312 please?". If you are calling a company to purchase a service, like booking a table at a restaurant or an appointment for a haircut, you can say: "I am calling to make an appointment". This is a good phrase to use when you don't know who is the best person to ask for. When you are on the phone to someone and they need to stop talking to you to find something out or transfer you to another telephone number, they will often say "Please hold" or "Please hold for a moment while I transfer your call". Another phrase you may hear which means the same thing is "Bear with me a moment". When the person you want to speak to is not available, the person on the phone might ask you if you want to leave instructions for them to read later. They will say: "Can I take a message?" or "Would you like to leave a message?". If your phone call is picked up by answering machine, it will usually ask you to "leave a message after the beep". Whether you leave a message with a machine or a human being, it is important to leave your telephone number in the message if you want the person you are trying to reach to call you back. If you are struggling with a phone conversation, it is OK to tell the person you are speaking this instead of trying to guess what they are saying. You can say something like: "My English isn't very strong, can you please speak slowly so I can understand you?". The most important thing on a telephone conversation is to be polite and friendly. Manners are very important in English speaking countries, and if you remember this people will be more likely to help you in a telephone conversation! Why not tell us some tips you have learned for speaking on the telephone in the comments section? Never be afraid to ask someone to repeat what they have just said. If you are traveling to the UK for an internship, then this is especially important during telephone interviews. Remember you can always ask the person to repeat what they have said. This is really important during telephone interviews. If you are traveling to the UK for an internship you may go on to answer the wrong question or miss an important piece of information.